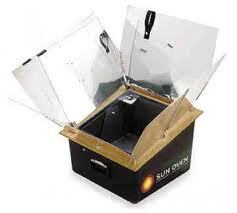 Instead of electricity or gas, solar ovens use the sun's energy to heat, cook and sterilize food. As an integral part of any survivalist's lists of must-have items, solar ovens are lightweight, easily set up and provide hot food in emergency situations lacking access to fuel for heating purposes. High-tech solar cookers are equipped with solar cells that store sunlight when it is plentiful so users can cook food at night or on cloudy days. Solar cookers are also becoming popular in underdeveloped countries where non-profit organizations are giving them to people who do not have access to electricity or live in areas where air pollution, desertification and deforestation is out of control. Ovens that operate using sunlight to heat food contain reflective mirrors made of polished metal or glass that concentrates the energy of the sun in a small area where the pot or dish sits. The interior parts of solar ovens are tightly sealed to prevent hot air from escaping, which inhibits the process of convection and allows the temperature to rise even on windy, cooler days. 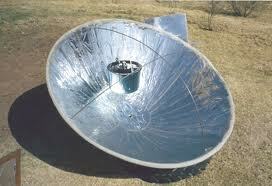 Small pieces of food are put into solar cookers since they cook faster. Vegetables and meats are cut into bite-sized cubes rather than being cooked whole. Some foods take longer to cook and should be started in the morning if they are to be included in a midday meal. Cooking with solar ovens means you do not have to turn or stir the food, since continually opening the cover lets heat escape and because it is not necessary due to the comprehensiveness of the heat. Factors affecting the time it takes to cook foods include the position of the sun, wind temperature, humidity level and latitude. Moreover, it is somewhat difficult to burn anything you put in a solar cooker, even if it has been cooking in the sun an hour more than it should have cooked. Some vegetables may lose their color and appear drab if cooked longer than usual, but the taste remains the same. The Sport Solar Oven manufactured by the Solar Oven Society cooks everything from fish and poultry to breads and cakes. Built to maintain a temperature of around 230 degrees Fahrenheit, the Sport Solar Oven has been called a "solar crock pot" and lets the true flavors of food emerge because you do not have to add any water. In addition, this solar cooker also pasteurizes water. Produced by Sun Ovens International, the Global Sun Oven is popular in developing countries as well as in the U.S. Because it is extremely well-insulated, the Global Sun Oven is viable in countries where people work all day and must eat their main meal in the evening. While food that has been cooked in other solar ovens need to be eaten before it is cold, this oven keeps food already cooked in the afternoon warm until it is eaten hours later. Reviews from users of both the Sport Solar Oven and the Global Sun Oven are positive, with the majority of reviewers complimenting the manufacturers on the ability of the ovens to produce food that is tasty, tender and juicy. Reviewers who live in hot, tropical climates state they love using solar ovens because they prevent their home from becoming unbearably hot. Solar ovens also reduce energy bills, with the potential for saving enough on gas or electricity bills in two years to actually pay for the oven.